That Sam “Mooney” Giancana was just sooo… tacky. Even for a mobster. Came across as some crass crazed combo of Ernie Borgnine, Joe Mantegna, Harvey Keitel, Al Pacino, Bobby De Niro, Jack Nicholson, Warren Beatty AND my friend Michael. To Sam Giancana, women were just like shoes: wear them out, throw them away, its nice if they’re the best-looking shoes you can buy, but they’re shoes any way you cut it, and that means disposable! Heir to the gory glory and Chicago throne of Al Capone, Sam Giancana boasted of links to at least seven U.S. presidents , and many top Hollywood stars, various entertainers and sports heroes, the CIA, the puppet monarch of King Farouk, and maybe even (gasp!) the Vatican. Gunned down in his own home only days before he was due to testify before Congress, he left a hideous legacy. Twenty-three years ago, this legacy impelled his goody-goody brother Chuck to change the family name into something more comfortable outta embarrassment and a desire for a “legit” life. 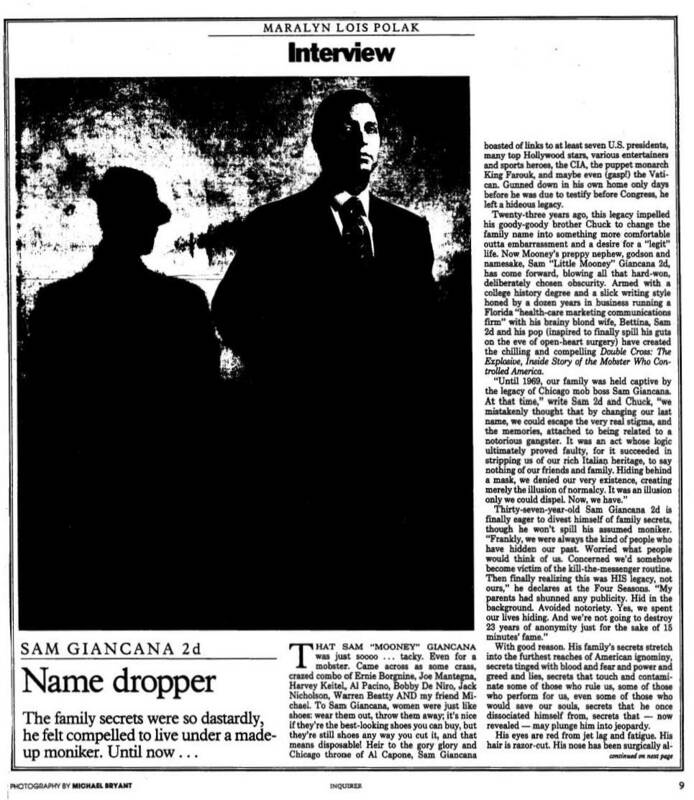 Now Mooney’s preppy nephew, godson and namesake, Sam “Little Mooney” Giancana 2d, has come forward, blowing all that hard-won, deliberately chosen obscurity. Armed with a college history degree and a slick writing style honed by a dozen years in business running a Florida “health-care marketing communications firm” with his brainy blond wife, Bettina, Sam 2d and his pop (inspired to finally spill his guts on the eve of open-heart surgery) have created the chilling and compelling Double Cross: The Explosive, Inside Story of the Mobster Who Controlled America. With good reason. His family’s secrets stretch into the furthest reaches of American ignominy, secrets tinged with blood and fear and power and greed and lies, secrets that touch and contaminate some of those who rule us, some of those who perform for us, even some of those who would save out souls, secrets that he once dissociated himself with from, secrets that – now revealed – may plunge him into jeopardy. His eyes are red from jet lag and fatigue. His hair is razor-cut. His nose has been surgically altered.